Mellieha beach is the largest sandy beach at Malta and also one of the most popular beaches. Located in the Northern part of the island at Mellieha Bay – also known as Ghadira Bay. Mellieha beach has very shallow water, almost ankle deep for about 50 meters out to the sea, so it’s very good if you plan to go there with small kids. Still if you go further, you can reach the deeper water to be able to swim. The coast is very large, wide and long, enough for a lot of people and you can choose between the active or calmer parts of it. 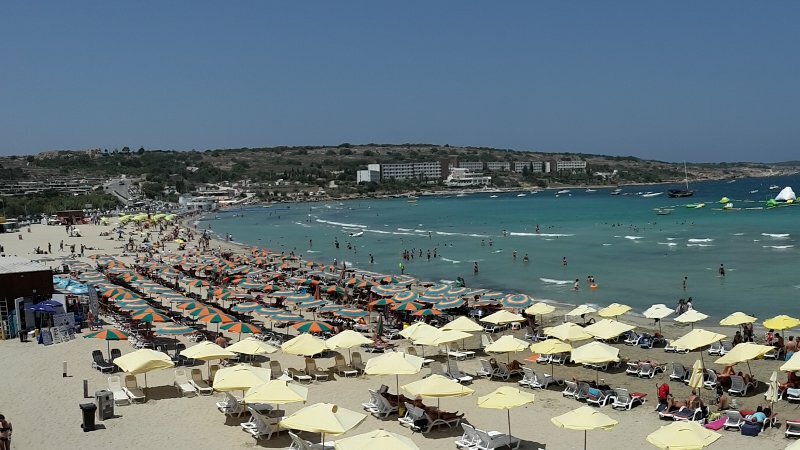 Mellieha beach is easily accessible even for people with mobility issues. Many buses stop there and there is a small parking area, but with car you have to get there early to find free space. In high season, afternoon the buses are mostly full and sometimes you just have to wait for the next one and the next one to be able to get on with the crowd. We even witnessed a situation where the bus driver had to “argue” with a man to please let the bus go, there is no space left. So be patient or take the bus later. The road is just beside Mellieha beach, but the beach is lower, than the road so the noise is not disturbing. Still, if you love water sports, Mellieha beach is ideal for that. The prices are relatively cheap, compared to other beaches and has long shallow water. While we were jetskiing, from the distance we were followed by the lessors on a little boat, to make sure we will be safe at the whole time. Diving is the only sport which you won’t be able to do at Mellieha beach. Like on other beaches at Malta there’s also no shade, only by umbrellas, which you can rent on the beach along with sun beds. The prices are as usual, around 4 – 8€ per people. 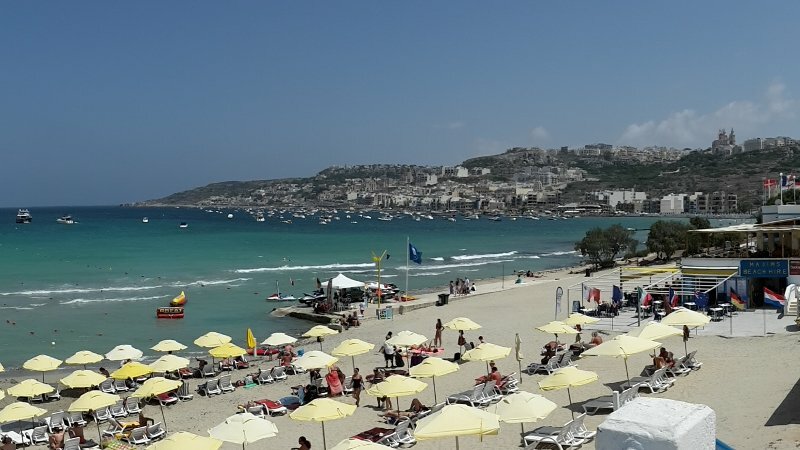 You can find mobile toilets and a few bars, restaurants and stalls on or beside Mellieha beach. I would say Mellieha beach is for families with kids, ok to visit once on a holiday, but there are much nicer beaches at Malta.